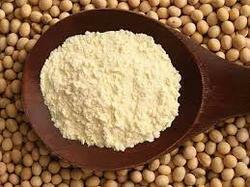 We are a leading Wholesale Trader of maxler 100% golden whey powder, maxler isomax powder, maxler special mass gainer powder and soy protein isolate from Mumbai, India. 100% Golden Wheyis a premium whey protein formula that utilizes the highest quality ingredients with the latest scientific research to get you the real results you deserve. Composed of the purest whey protein sources, it provides rapid absorption into the bloodstream. This is very important during the period of an intense workout when it's necessary to take in a lot of protein in order to maintain nitrogen balance and feed muscles with amino acids essential for recovery and growth. 100% Golden Wheyis easily digested and optimized to deliver BCAA and other essential amino acids to insure quick muscle repair as well as muscle maintenance during a postworkout period. 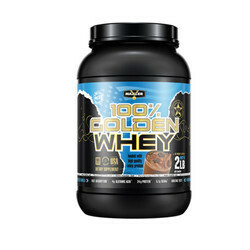 100% Golden Wheyis perfect for powering you through those high intensity workouts like never before. Mix one serving (33 grams) with 6-8 oz of water, milk or your favorite beverage. To achieve your desired consistency vary the amount of liquid. Whey Protein Blend (Whey Protein Concentrate, Whey Protein Hydrolysate, Whey Protein Isolate), Natural and Artificial Flavors, L-Glutamine, Guar Gum, Salt, Branched Chain Amino Acids Blend (L-Leucine, L-Isoleucine, L-Valine), Enzyme Blend (Protease, Amylase, Lactase), Acesulfame Potassium, Sucralose, Tripotassium Citrate. 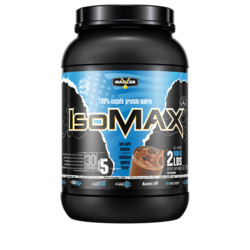 IsoMax is the ideal blend of 100% milk and whey protein isolates. IsoMax contains a Branched Chain Amino Acids (BCAA) complex of L-Leucine, L-Valine and L-Isoleucine. The addition of Glutamine makes IsoMax a unique product with extra bioavailability. IsoMax has been released from carbohydrates, making it an ideal supplement for those, who are on a low-carb diet. By using IsoMax, you will quickly be able to create lean muscle mass while nourishing your body with well balanced nutrients that aid in post workout recovery, while its rich dense flavor will leave no doubt that IsoMax is the product you should decide in favor of. Mix one serving (30 grams) with 6-8 oz of cold water. To achieve your desired consistency vary the amount of liquid. Take 2-3 servings per day between meals. Protein Blend (Whey Protein Isolate, Milk Protein Isolate), Amino Blend (L-Glycine, L-Leucine, L-Isoleucine, L-Valine, L-Glutamine), Cocoa Powder, Inulin, Natural & Artificial Flavors, Suspension Blend (Xanthan Gum, Cellulose Gum, Carrageenan), Sucralose, Potassium Chloride, Acesulfame Potassium, Sea Salt. Special Massis a scientifically engineered and an Extremely Powerful mass building formula which is designed for active people who want to get the benefits of top quality proteins with increased amounts of complex of carbohydrates and nutrients for finest health and muscle performance. This product is created especially for individuals who find it hard to gain mass, as well as athletes that need a high carbohydrate meal to go with an endurance-training program. Every serving of Special Mass delivers 6 different premium grade proteins such as Whey Protein Concentrate, Whey Protein Isolate, Milk Protein Isolate, Micellar Casein, Egg Albumin and Whey Protein Hydrolysate. The high-quality Carbo Clean creates a sustained release of nutrients critically important to your mass gain phase providing the ultimate mass fuel and promoting faster growth. The massive Amino Acids includes over 6 grams of BCAAs in every serving what helps to improve performance, prevent muscle breakdown and promote a speedy recovery. The premium Enzyme enhances digestion and ensures that you get the greatest possible nutritional value from your protein drink. And all this comes with an unbelievable delicious natural flavor! Musclefuel The clean, high-quality carbohydrate helps to increase energy, refuel your muscles and promote faster growth. MULTISTAGE The perfect combination of fast, intermediate and slow releasing proteins encourages rapid muscle growth and support both short and long-term health. Energocore Active ingredients enhance the new advanced strength blend to promote an extended workout and lead to longer and harder performance on the way to your goals. Powermax The multiple blends of the new formula in combination with the special delivery mode provide the best and the most effective muscle-building process. Myorecovery The powerful BCAA complex guarantees that your body will get all the needed ingredients to stimulate muscle growth and recovery in every cell of your body. As a dietary supplement, mix 4 scoops (240 g) of Special Mass with 17-20 oz of water or milk, depending on your desired consistency. 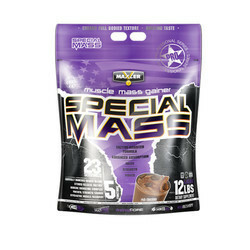 For best results consume one full serving of Special Mass immediately following an intense workout. On non-workout days we recommend consuming 2 scoops in the morning and another 2 scoops in the evening, preferably between meals. Mix each half serving with 8 oz of water or milk. You may use more or less liquid to achieve desired consistency. Additional servings may be used throughout the day to meet your daily protein and calorie requirements. Carbo Clean Blend (Maltodextrin, Fructose, Waxy Maize), Protein Blend (Whey Protein Concentrate, Whey Protein Hydrolysate, Whey Protein Isolate, Milk Protein Isolate, Micellar Casein), Cocoa Powder, Peanut Flour, Natural and Artificial Flavors, Silicon Dioxide, Lipid Blend MCT Oil [(from Coconut), Alpha Lipoic Acid, Flax Seed Oil Powder], Creatine Monohydrate, BCAA (L-Leucine, L-Isoleucine, L-Valine), Suspension Matrix (Xanthan Gum, Cellulose Gum, Carrageenan), Enzyme Blend (Protease, Amylase, Lactase), Sucralose.